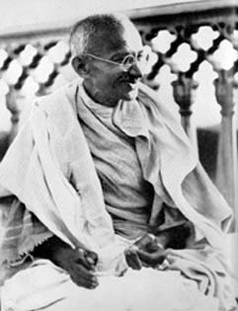 Mahatma Gandhi has most probably realised his ambition of attaining moksha [spiritual liberation] and is unlikely to return to earth. However, should he do so, he would be deeply disturbed by many aspects of contemporary India. He would be shocked at the corrosive corruption that has spread to all walks of life and eroded the great moral capital that he and his colleagues left behind by exemplifying in their lives the highest norms of public life. It is not the petty corruption of a junior government officer that would have worried him, but rather the way in which the common good of the country is constantly sacrificed at the altar of sectional and individual interest and the almost total absence of embarrassment and guilt with which it is done. Gandhiji would be even more saddened by the depth and extent of poverty. On the official criteria of earning one dollar a day, 25% of our people live below the poverty line. But if this poverty were to be defined in terms of calorie consumption and the satisfaction of basic needs, the figure would rise to 60%. Gandhiji would see this as nothing short of a national shame. He would consider it a betrayal of his legacy that no systematic movement has been mounted for the abolition of poverty and the growing economic inequality in the 60 odd years of India’s Independence. He would be equally disturbed by the country’s lack of an inspiring moral vision. It has set its eyes on becoming an economic super power by 2020 on a growth rate of between 5 and 7 percent. Gandhi would want to know the point of this. Economic growth exploits nature, creates deep inequality, puts enormous pressure on social and political institutions and encourages mindless consumerism. At best, it can be a means to a worthwhile goal but never an end in itself. Gandhiji would want to know what great moral and political ideals we intend to realise by means of economic growth and how we intend to make India a humane and compassionate society. Gandhi would have been shocked by the increasing cultural philistinism and lack of moral idealism of the new middle class, on which he had placed his hopes for Independent India. The middle class of his time had a strong social conscience. It was bi-cultural and at ease with both the Indian and the Western tradition. It was both rooted and open, and took a morally serious approach to human life. It had certain standards by which it aspired to live and felt guilty when it could not. The new middle class could not be more different. It lacks social conscience and has little regard for the worse off. It is rootless and is neither well versed in its own traditions, nor in those of the West. It is culturally and economically insecure and prone to panic. Its primary concern is to make money and spend it in shallow pursuits. Faced with all this, what would Gandhiji have done? First, he would have mounted a campaign of satyagrahas against clearly identified and suitably dramatised cases of inequality and injustice. In doing so he would have offered the victims of injustices a badly needed alternative to Naxalism. Second, he would have built up a nationwide cadre (lok sevak sangh) of committed workers, dispersed them in villages and expected them to attend to local problems and act as a powerful check on the local power structure. Third, he would have set a personal example of incorruptibility and inspired his close colleagues to do the same. Fourth, he would have thrown up a political movement that would have cleared away the decaying and unprincipled political parties and created a space for the emergence of new ones. Finally, while confronting a situation like the destruction of the Babri Mosque in 1992, he would have explored all possible political ways of resolving the issue peacefully. He would have put pressure on Hindu and Muslim religious leaders to work out a compromise, which was not impossible and perhaps suggested building a multi-religious complex around it to symbolise India’s commitment to religious pluralism. If Hindus had still insisted on destroying the mosque, he would have seen it as a grave violation of their great tradition of tolerance and an indelible stain on the national conscience. He would have felt that he had no choice but to embark upon a fast, even perhaps a fast unto death, to save the honour of the religion and the country that he loved more than his own life. Centre for the Study of Democracy in the University of Westminster. Nearly all the communities in India(such as Bengali), are succumbed in ‘Culture of Poverty'(a theory once introduced by an US anthropologist Oscar Lewis), irrespective of class or economic strata, lives in pavement or apartment. Nobody is at all ashamed of the deep-rooted corruption, decaying general quality of life, worst Politico-administration system, weak(immature) mother language, continuous absorption of common space(mental & physical, both). Becoming parents only by (blindfold) self-procreation, simply depriving their(the children) fundamental rights of a decent, caring society, fearless & dignified living. Do not ever look for any other positive alternative behaviour(values), i.e. deliberately co-parenting of those children who are born out of ignorance, real poverty. All of us are being driven only by the very animal instinct. Can the Indians(Bengali) ever be able to bring that genuine freedom (from vicious cycle of ‘poverty’) in their own life/attitude, start within themselves ‘Production of (social)Space’, at least initiate a movement, by heart.